Cleaning and caring for your mounts on a regular basis keeps them looking nice and they will generally last longer. Two things that have a negative effect on mounts are dirt and sunlight. First, I will discuss dirt. 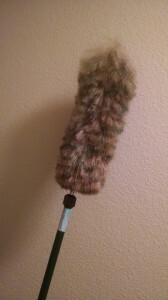 For a quick, periodic dusting you can use a type of “feather duster”. The type I use is sold under the name “Trophy Duster”. (see photo) There are many similar styles of dusters that work well. The ones with a telescopic handle work well on mounts that are hung up high. This works well for getting most of the dust and cobwebs off. Far too many times, I have gone in to customer’s homes and trophy rooms to see mounts with dust bunnies hanging off the whiskers and the eyes having a dull hazy look because of the dust. Carefully running the duster over the mount will take care of most of that. How often you do it depends on how much dust is in the room. I would say in most homes, doing this twice a year is good. Note: Be carefull when dusting fish with this type of duster as they can get snagged on the spiny dorsal fins. The next stage of cleaning is to take a cloth, LIGHTLY dampened with water and carefully wipe the mount down. You don’t need to scrub it. Just go in the direction of the hair or feathers. You don’t want to wet down the mount. Just enough water on the cloth for the dust to stick to it. Be especially careful around the eyes and nose of mammals. If you get these areas too wet, you could soften the thin skin or even the paints used for finishing. With birds, I would emphasize a VERY LIGHTLY dampened cloth. More care has to be taken with birds so as not to get the feathers wet or rearrange them. This type of cleaning can be done once every year or two. Again, depending on the room. For bears, coyotes, musk ox and other mammals with fine fur such as these, you can still use the feather duster but I do not recommend wiping them down with a damp cloth. 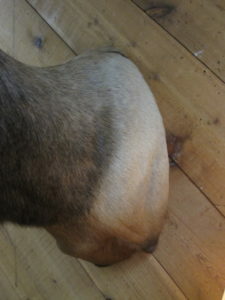 For those, a strong hair dryer or compressed air works better for getting the dust out of the fur. As you can imaging, using this method is a little messier, blowing dust around the room if you do it while it is hanging on the wall. Therefore, it is desirable to take the mount off the wall and take it outside or in a garage. Compressed air with a blowing nozzle works best but a good hair dryer will do the trick. The hair dryer actually works well for “grooming” the mount once it has been cleaned. You can often get the hair uniformly fluffed up. You can also carefully use a vacuum cleaner with a brush attachment for these mammals. You can use the damp cloth for the shorter hair around the muzzle or face. If needed, you can carefully groom just about any mammal mount after cleaning with an old hair brush. If needed, you can use a lightly dampened cotton swab or “q tip” to clean around the eyes, nostrils and the teeth, gums and lips of open mouth mounts. Regarding sunlight, the best filtered, “low E” glass works fairly well to prevent fading. I say fairly well as I don’t think there is any glass that will prevent all sun damage and fading. Even indirect sunlight fades mounts. The less sunlight, the better. Sunlight seems to fade mammals the most.